Today’s consumers have lots of options to find local businesses, and they use them all. There’s no fixed path to purchase — customers each travel a different route through their favorite apps, media and websites to find and select where they will spend their hard-earned money. The Local Search Association (LSA) conducted its annual Local Media Tracking Study of more than 8,000 consumers in 2015 and found that consumers started their search for local information most commonly with search engines, but only by a plurality — 40 percent. The rest of consumers turned to a variety of other media as their first source, including company websites, directories, review sites, newspapers and mobile apps, as illustrated below. 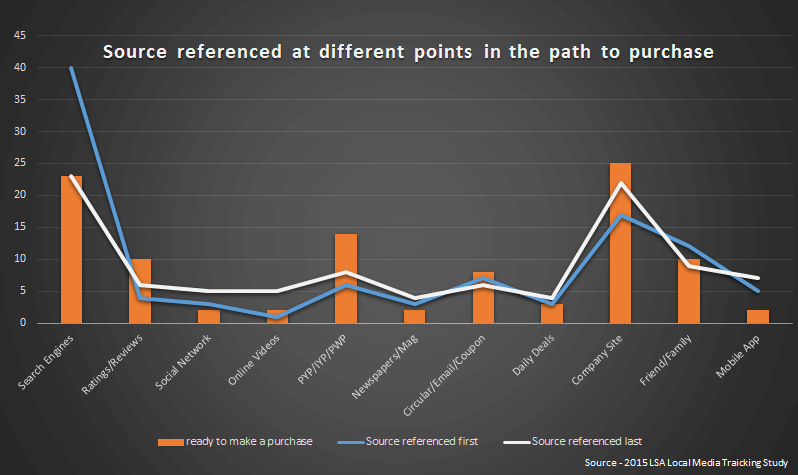 LSA data also reveals that consumers’ choices flatten out away from search engines as they venture deeper into the path to purchase. Typically, when consumers are ready to make a purchase, or they make one last visit to a media source, they choose the types of media that provide more direct contact with a business. These include company websites and directories, or those that help people confirm their prospective decisions, such as ratings or review sites. Data from YP corroborates this trend. In a report titled ZigZag: The New Consumer Journey Zeitgeist, YP found that 36 percent of local search started with a search engine, with the rest spread out over numerous other media. A study commissioned by Google in 2011, the results of which were published in an e-book entitled, “Winning at the Zero Moment of Truth,” revealed that in one year, consumers essentially doubled the number of sources of information they referenced to make a shopping decision, from 5.3 sources in 2010 to 10.4 sources in 2011. That was a time when the top three stimuli for generating interest in a product were TV ads, direct mail and newspaper ads. Today, more time is spent in apps than watching TV. Thus, it’s now likely that the total number of sources referenced before making a buying decision is much higher than 10 — or at least overwhelmingly digital. 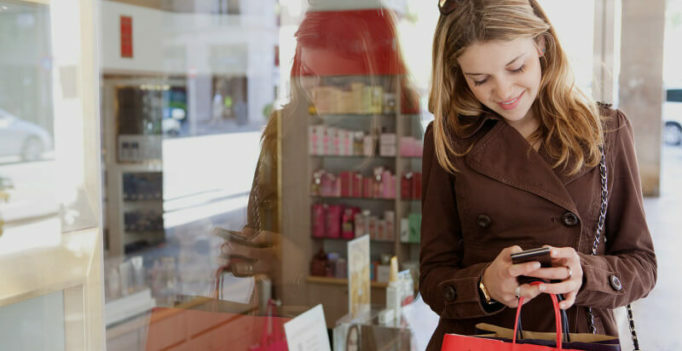 While the zig-zag through the path to purchase includes jumping between devices like desktops, laptops, tablets and smartphones, mobile phones are where much of the action lies. 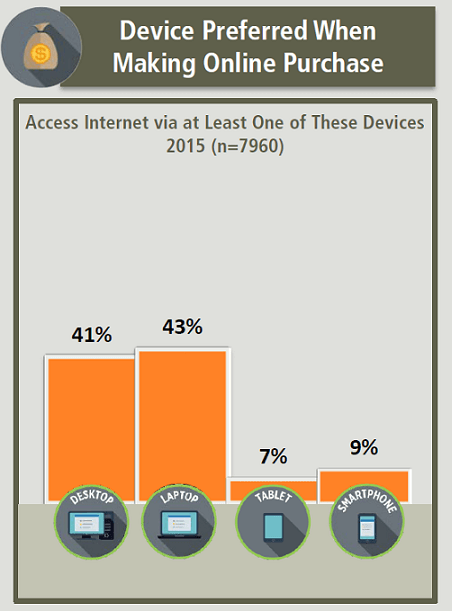 All four devices are used extensively at home to browse the web. But at work (47 percent), when shopping (57 percent) or while on the go (47 percent), consumers predominantly use their smartphones. The other devices scored no higher than 29 percent at work. 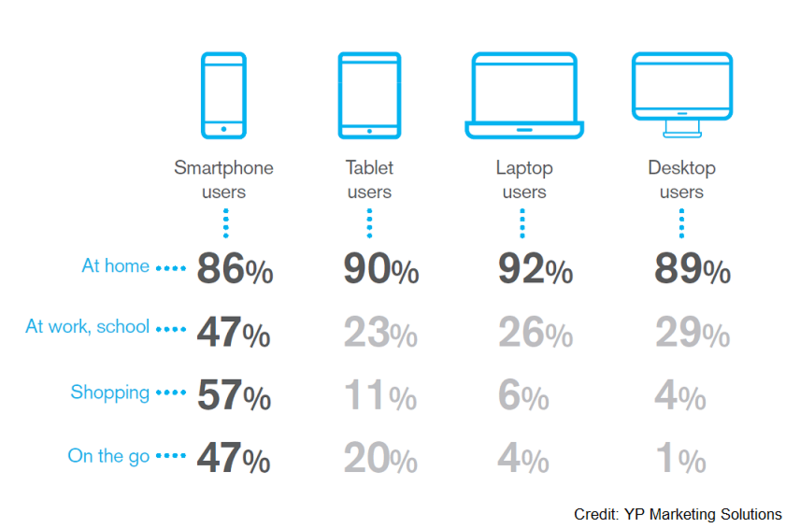 While on the go, tablets were used only by 20 percent, and shopping was even lower, at 11 percent. Desktops and laptops were understandably in single digits. However, for online purchases, once research is complete, consumers prefer desktops and laptops. LSA’s Local Media Tracking Study indicated that a combined 84 percent of consumers prefer desktops and laptops when making online purchases while only seven percent preferred tablets and nine percent preferred smartphones. Together, this poses a challenge for local businesses. Their customer base and audience is fragmented, and reaching them requires a presence on many different devices, locations and media channels. Each form of media also has numerous platforms or outlets. For example, deciding to have a social media presence might require content on Facebook, Twitter, LinkedIn, Instagram, Pinterest, Google+, Tumblr and others. The permutations of combinations of variables are overwhelming. Is it possible for a local business to manage this complexity on its own? When is it appropriate to use a marketing agency or partner? There are very substantial things that business owners can do on their own that will make a huge difference in being found, no matter where the consumer is in his or her search, discovery or purchase decision. But there are also some that are, for most business owners, too technical or time-consuming to handle. I’ll briefly cover the major areas you can DIY and those that you should work with a marketing expert on. Following are some basic tips on things you can do yourself to make sure you get found no matter how the consumer searches. I should caution that this is not a recommendation that you do it on your own. 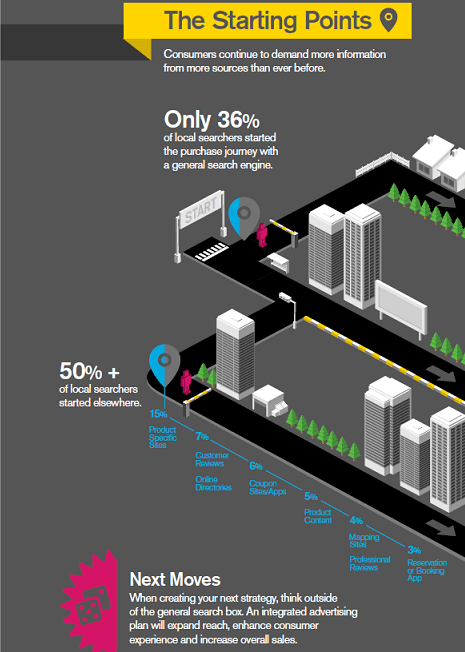 Search remains the dominant way for businesses to be found. Search drives almost 39 percent of all traffic to shopping websites, according to SimilarWeb’s 2016 Global Search Marketing Report. While at first blush, that might seem low, social media, display ads and email came in at 3.91 percent, 1.32 percent and 0.56 percent, respectively, so search drives 10x or more traffic than each of these. Direct traffic and referral traffic are the other major drivers. Your online business listing with the major search engines is the foundation of your online presence and identity. You need to claim your listing, make sure it is accurate, provide relevant details that allow users to find your business and provide information to help them choose it. These listings will impact not just local search on search engines but other tools such as maps. Do a Google search for your business category locally, and you’ll find that many results are actually other directory websites. For example, first page results for the search “Electrician near me” might surface results from Yelp, the BBB and Yellowpages.com. It’s important to claim your listing and profile on these sites, as well, where many consumers find business information. Critical information to update includes business contact details (name, address and phone), business category/description, hours, a link to your website and pics. YP’s report found that images were far and away the most desired content, with 78 percent of consumers stating that they liked to view images. YP’s report states that 48 percent of local searchers start searching at a topic site for familiar subjects, and 37 percent prefer specialized search for things like travel and restaurants. For example, those searching for doctors might visit ZocDoc or Healthgrades. Those looking for lawyers might visit Avvo. Travelers visit TripAdvisor and homeowners visit Angie’s List, HomeAdvisor and Thumbtack. Each of these sites allow businesses to provide various degrees of detail in their free listings or profiles. You can already tell there are a great many places where your business might be listed and found online, and those mentioned above are just a few of the major ones. Most business listings are obtained by directory sites from a few primary sources called “Aggregators” and become the default information for unclaimed listings. There are even reports that on some sites, the information from these aggregators overwrite listings that have been claimed. These are free for the business to claim and update so that the information being disseminated is consistent and accurate. Reviews have become an integral part of the path to purchase — so much so that they are no longer just part of the rating sites like Yelp, but every listing you find online, including Google Maps, Yellow Pages and Amazon. YP reports that nearly half of all consumers never buy without first checking reviews online. I’ve previously reported that while 90 percent of consumers would leave a review if asked, only seven percent have been asked. That’s a huge opportunity to boost a valuable marketing resource that most consumers find important to their evaluation of a business, and it’s an opportunity that presents itself at the point of sale. And while 80 percent of consumers who posted reviews did so after a positive experience, local businesses fear the consequences and dealing with negative reviews. While this is not the place for a tutorial on how to deal with negative reviews, responding is a case-by-case decision, and the response itself is a personalized message addressing the complaint. It’s best for the local business to handle managing these reviews on its own. Email is familiar and easy to understand. There are hundreds of email software programs to help you manage it on your own. It is a direct communication and can be sent immediately or scheduled for the future. There are many nuances and tricks that can make email more effective, such as targeting, personalization and persuasive writing, but regardless, it is a medium you can keep simple. Because of the familiarity of using email, it’s fairly easy to manage this type of marketing on your own. Providing core content about your business, such as hours of operation, directions, menus, website links and business descriptions is easy to do, and the fairly static nature of such information means it doesn’t require frequent updating. But if it does change, make sure you update it. The fastest way to lose customers is to frustrate them by being closed when information indicates you’re open, direct them to an old store location, or even charge them more than they expected based on seeing an old menu. Other content that is appropriate for you to manage on your own includes communicating custom events such as sales, special deals, store events or community involvement. Use of social media, emails, website updates and other media can get the word out about these events quickly and timely. Of course, you could do any of these tasks on your own. You could represent yourself pro se in court in a legal dispute. Just because you could, it doesn’t mean you should. Local business owners’ expertise also varies widely, and what might be practical for one business owner to manage would not be for another. But in general, these tasks require a higher level of expertise or a greater commitment of time than some of those mentioned above and are good areas to look for help with. SEO involves optimizing your content, website and listings to appear in organic search results when a user types in a search query on Google, Bing or other search engines. SMBs consistently rate SEO as the area they need the most help with, and it’s not hard to see why. Moz publishes an annual report on the factors that influence page rank within Google’s search engine algorithm. A brief glance at some of the 2015 survey results indicates how complex an area this is. Enough said. SEM involves paid advertising that is displayed in response to a search engine query. The ads often appear as “sponsored” listings at the top of the search engine results page (SERP) or in some other form, such as banners or enhanced listings but related in content to the search query. Google’s AdWords is the most popular SEM platform. At LSA’s SMB Bootcamp in March, we asked how many local businesses engaged in an SEM campaign. Only two or three people out of more than 100 attendees indicated they currently were using an SEM campaign, although 40 percent to 50 percent indicated they had tried one in the past. This indicates two things: (1) These largely DIY business owners did not have great success managing SEM campaigns; and (2) there seemed to be an opportunity to get visible placement on SERP if SEM could be managed successfully given the seemingly low level of competition. Good marketing providers have the expertise to help plan and manage an SEM campaign within your budget and help optimize ad campaigns for platforms like mobile. Content marketing includes things such as blog posts, social media updates and newsletters — content that tends to be focused more on education or information rather than selling. YP reports that 55 percent of consumers find it important to view related content when searching for products and services. The problem is that content marketing is extremely time-consuming. Even updating informational content discussed above may be simultaneously easy and daunting. While it may not be rocket science, writing quality content on a regular basis can be a challenge. A survey conducted by Thrive Analytics for the Local Search Association reported that 60 percent of content by DIY SMBs only gets updated every six months (or less frequently). Getting found is only half the battle. Getting chosen requires appealing to the customer, and bad or stale content is a turnoff. Fresh content boosts SEO, engages audiences and raises the profile of your brand. It’s worth investing in. A surprising number of small businesses still do not have a website. In fact, a recent 2016 survey by Clutch indicated that 46 percent of the small businesses it surveyed did not have a website. Only 12 percent of those indicated that they didn’t have a website because they were using a social media profile as a substitute. The biggest reason given for not having a website: 32 percent felt it was not relevant to their business or industry. Twenty-one percent felt they lacked technical knowledge or didn’t want to manage the ongoing maintenance. This is surprising given the many sources that support the importance of a website. LSA’s own research shows that 50 percent of consumers state they are extremely likely to look at business websites when searching for a local business, and 57 percent of consumers won’t recommend a business with a poorly designed site. So get someone to help you build a website. 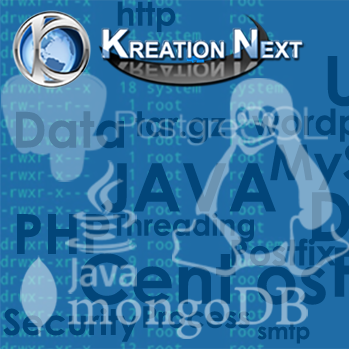 While there are DIY platforms to help build your own website, the number of technical variables is high. Things to consider include mobile optimization, use of keywords, load time, page format and other technical factors. There are numerous ways for small businesses to use video in their marketing, including instructional videos, demonstration videos, product review videos and showcase videos. The popularity and demand for video is well-documented. According to a white paper put out last year by Cisco, video made up 64 percent of all internet traffic in 2014, and that number is predicted to grow to 80 percent by 2019. Video also can have a material and positive impact on SEO. LSA’s research revealed that 47 percent of SMBs found budget to be an obstacle to using video, and 45 percent said they lacked expertise. But newer technology makes video much more accessible and cost-effective for small businesses today. Marketing providers can help you determine the best video format and style for your budget and produce high-quality videos that appeal to your customers. It may seem like overkill for local businesses to try and adapt to the constantly changing marketing technology scene like wearables, virtual reality and personal assistants. Yet there are some that are worth looking into — technologies that help lower costs and improve efficiencies, such as programmatic advertising and CRM tools. Other technologies that consumers are rapidly adapting to and demanding, such as e-commerce, online booking, mobile payments and fast-loading web pages, are sufficiently established that investing in them should pay off. Early adopters can also get a competitive advantage over those who lag behind. While you should certainly be selective in choosing what new technologies to try, marketing providers can help you understand and explore those that make sense for your business. One mistake that many businesses make is segregating marketing media and platforms into separate islands, even though consumers expect cross-media experiences. They want to research a product at work and buy it when they get home. Or look up a business on their PC and later get directions on their phone. Lacking a cohesive marketing strategy can also lead to buying ads that drive traffic to a stale social media page or website. It can result in inconsistent or even conflicting information that frustrates customers, such as different prices or incorrect store hours. Inconsistent messaging also waters down the compound synergy necessary to building a brand. In marketing, the sum is greater than its parts. A good marketing provider will help design a cohesive strategy so that all pieces complement one another and work together toward the big-picture goal of growing your business.